1. 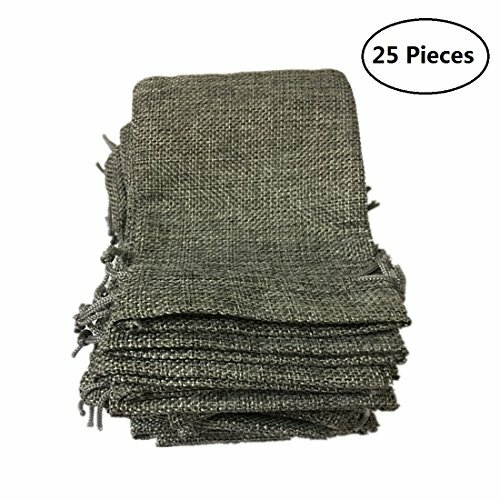 High quality Burlap Fabric, no toxic, safe to use, soft and reusable, fine mesh is breathable, durable to use and comfortable to touch, can use for a long time, not easy to break! 2. They can be applied to store gifts, snacks, cream jars, candy, wedding favors, makeup bottle, coins, jewelry and Valentine's Day party favors! 3. Great for small accessories, crafting and DIY design projects, handmade items and personalized presents for packing small gifts for friends and family. Suitable for adults and kids! 4. Each bag is installed with jute drawstring to keep the inside contents safe and make the bag easy to open or close! 5. Drawstring Gift Bags: Drawstring design make these burlap pouches easier to seal so avoid objects lost, and you can use the the string loop as pouch handle as well, good for both home and kitchen needs in daily life. Portable enough make them convenient to carry when you go out or ramble or travel! Ease to use: Drawstring design make these burlap pouches easier to seal so avoid objects lost, and you can use the the string loop as pouch handle as well. Wide range of uses: The natural bags befit rustic, country, beach and outdoor wedding. Great for Wedding, Birthday Party Favors, Jewelry collection. Can be applied to store spices, candles, craft pieces, wedding favors, coffee beans, soaps, soap nuts, gift cards, small food items, or simply give out as party favors for activities. Drawstring burlap bags material: Made of high quality Burlap Fabric, no toxic, safe to use, soft and reusable, fine mesh is breathable, durable to use and comfortable to touch, can use for a long time, not easy to break. They can be applied to store gifts, snacks, cream jars, candy, wedding favors, makeup bottle, coins, jewelry and Valentine's Day party favors. Size: 3.7 x 5.3 inches(9.5 * 13.5cm) storage capacity. Great for small accessories, crafting and DIY design projects, handmade items and personalized presents for packing small gifts for friends and family. Suitable for adults and kids. 25 Pack party favor bags: Package includes 25 pieces burlap gift bags, it's adequate for you to use. Each bag is installed with jute drawstring to keep the inside contents safe and make the bag easy to open or close. Drawstring Gift Bags: Drawstring design make these burlap pouches easier to seal so avoid objects lost, and you can use the the string loop as pouch handle as well, good for both home and kitchen needs in daily life. Portable enough make them convenient to carry when you go out or ramble or travel. Wide range of uses: The natural bags befit rustic, country, beach and outdoor wedding. Great for Wedding, Birthday Party Favors, Jewelry collection. Can be applied to store spices, candles, craft pieces, wedding favors, coffee beans, soaps, soap nuts, gift cards, small food items, or simply give out as party favors for activities! If you have any questions about this product by Tsuen, contact us by completing and submitting the form below. If you are looking for a specif part number, please include it with your message.